Ebrahimi, R., Solhjoo, S. (2007). Characteristic Points of Stress-Strain Curve at High Temperature. International Journal of Iron & Steel Society of Iran, 4(1), 24-27. R. Ebrahimi; S. Solhjoo. "Characteristic Points of Stress-Strain Curve at High Temperature". 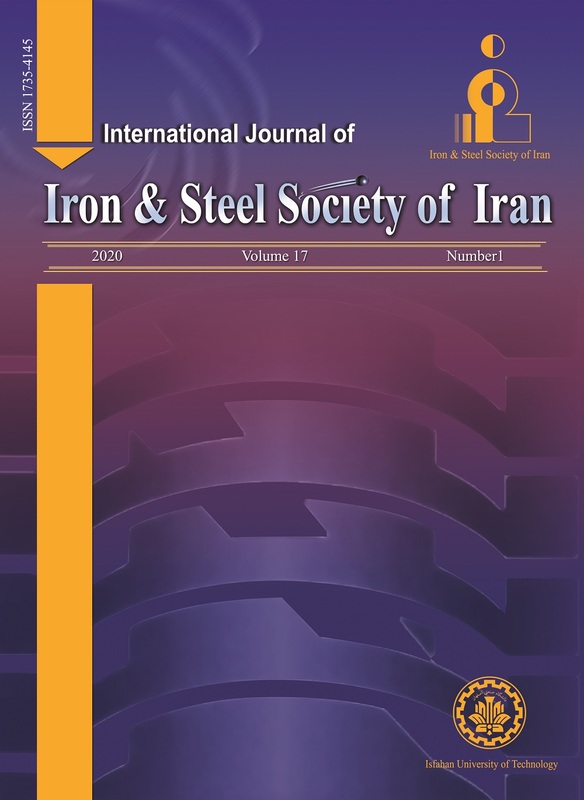 International Journal of Iron & Steel Society of Iran, 4, 1, 2007, 24-27. Ebrahimi, R., Solhjoo, S. (2007). 'Characteristic Points of Stress-Strain Curve at High Temperature', International Journal of Iron & Steel Society of Iran, 4(1), pp. 24-27. Ebrahimi, R., Solhjoo, S. Characteristic Points of Stress-Strain Curve at High Temperature. International Journal of Iron & Steel Society of Iran, 2007; 4(1): 24-27. Determination of critical points on hot stress-strain curve of metals is crucial in thermo-mechanical processes design. In this investigation a mathematical modeling is given to illustrate the behavior of metal during hot deformation processes such as hot rolling. The critical strain for the onset of dynamic recrystallization has been obtained as a function of strain at the maximum stress. In addition, the transition strain from static recrystallization to full metadynamic recrystallization has been presented to form an equation as a function of peak strain, peak stress and steady-state stress. The results of this mathematical modeling are in a good agreement with the experimental data. T. Altan, F. W. Boulger, ASME Journal of Engineering for Industry, 95(1973), 1009. R. Kishore, T. K. Sinha, Metall. and Mater. Trans. A, 27(1996), 3340. S. Serajzadeh and A. Karimi Taheri, Mater. Design, 23(2002), 271. S. I. Kim, Y. Lee, D. L. Lee, Y. C. Yoo, Mater. Sci.Eng.A. 355(2003), 384. J. M. Cabrera, J. Ponce, J. M. Prado, J. Mater. Process. Technol. 143-144 (2003), 403. S. H. Zahiri, C. H. J. Davies, P. D. Hodgson, Scripta Mater., 52(2005), 299. M. Zhou, M. P. Clode, Mech. Mater. 27(1998), 63. G. E. Dieter, Mechanical Metallurgy,McGraw-Hill,New York, 1987. A. Cingara, H. J. McQueen, J. Mater. Process. Technol. 36(1992), 31. A. Laasraoui, J. J. Jonas, Matall. Trans. A, 22(1991), 1545. E. I. Poliak, J. J. Jonas, ISIJ Int. 43(2003), 684. W. P. Sun, E.B. Hawbolt, ISIJ Int. 37(1997), 1000. P. Uranga, A. I. Fernandez, B. Lopez, J. M. Rodriguez-Ibabe, Mater. Sci.Eng.A, 345(2003), 319. A. M. Elwazri,E. Essadiqi, S. Yue, ISIJ Int. 44(2004), 744. N. D. Ryan, McQueen, Flow Stress, J. Mater. Process. Technol. 21(1990), 177. R. Ebrahimi, S. H. Zahiri, A. Najafizadeh, J. Mater. Process. Technol. 171(2006), 301.